The World Cup began yesterday, and new data has revealed that it could present quite the opportunity for social brands using innovative marketing strategies. 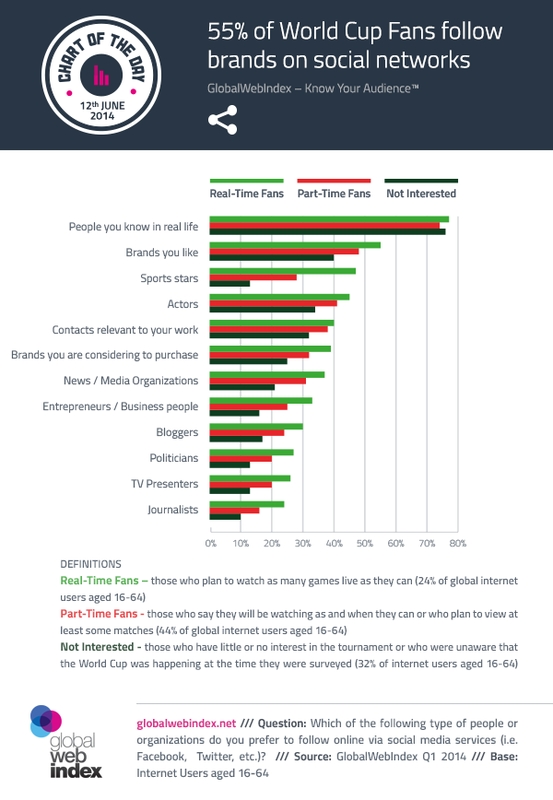 More than half (55 percent) of “real-time” World Cup fans – those that plan to watch as many games live as possible – follow brands on social platforms such as Facebook and Twitter, reports GlobalWebIndex, with almost two in five connected to brands from whom they are considering making a purchase. The study noted that these real-time fans over-index more than part-time fans or those who do not plan to watch the World Cup at all across every category in the poll.